SANTA ANA, CA. – (Oct. 25, 2016) – Yokohama Tire Corporation has added four new sizes to its 104ZR™ urban/regional all-position/steer tire line-up: 225/70R19.5, 245/70R19.5, 265/70R19.5 and 285/70R19.5. 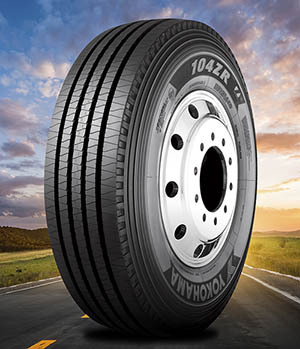 “The 104ZR is a true workhorse that’s designed to deliver longer treadwear, low rolling resistance and even wear, making it especially ideal for high scrub applications,” said Tom Clauer, Yokohama Tire manager of commercial and OTR product planning. Clauer said the 104ZR is also still available in its original sizes: 295/80R22.5, 9R22.5, 10R22.5, 11R22.5 12R22.5 and 315/80R22.5. -- Long-lasting, outstanding performance: A five-rib, full-depth tread pattern delivers an exceptionally smooth and quiet ride. Plus, Yokohama’s serpentine groove pattern is designed specifically to reduce premature shoulder step-down and irregular wear, further preserving overall tread life. The 104ZR also employs Yokohama’s Zenvironment® technology, which accurately predicts casing growth and helps with stabilized performance over the life of the tire, longer casing life and better retreadability. -- Improved fuel economy: Specialized compounds, which are stronger and more pliable, improve treadwear and low rolling resistance. -- Superior protection and durability: Block-shaped stone defense ribs prevent stones from traveling to the bottom of the grooves, reducing casing damage by up to 25 percent to ensure greater durability and retreadability. Also, an ultra-wide top steel belt increases rigidity across the entire tread surface for enhanced durability and to avoid casing damage.